Do you need to remove old insulation in your home’s attics or walls? Sometimes insulation removal is necessary prior to re-insulation (retrofitting). If you need insulation removal and replacement services for your home or building in Houston, Cypress or a surrounding area in Texas, the team at Installed Building Products Houston has you covered. Our experts offer professional insulation removal—contact us or call 281-653-8382 281-653-8382 to schedule a consultation or keep reading to learn more. 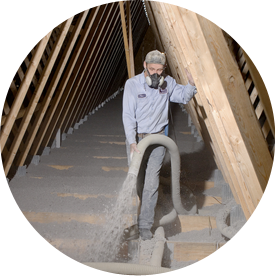 The Installed Building Products Houston team specializes in attic re-blow insulation jobs. We can remove old insulation in your attic and install new, high-quality blown-in fiberglass. We will determine the right R-value and insulation solution for your project so you can save money and live more comfortably all year long. If you need old or damaged insulation removed in your home or commercial building, IBP Houston can help. We will remove the insulation, clean the area and install new, high-quality insulation. We specialize in fiberglass and radiant barrier solutions. No matter your insulation removal and installation needs in the Houston, Texas area, our professionals can meet them. To learn more about our services, call us at 281-653-8382 281-653-8382!